Planning on visiting Amsterdam any time soon? 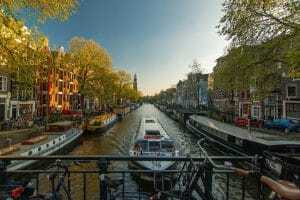 Then be sure to not miss a boat trip in Amsterdam on the canals! As Amsterdam has a lot of canals running through the city, the boat is a very nice way of looking at the city from a different perspective. You can sit back and relax and take up all the beautiful architecture and history this cosy city has to offer. Most of the boat tours that are offered, have a guide on board who tells you alle about the history of the city. Some tour operators don’t have a guide live on board, but they will give information through speakers or you can have an individual device specific to your language. The tour guides on the boats can tell you stories at every corner of the canals! It’s incredible. Amsterdam used to be a trading city and had a very important location in The Netherlands for traders. So there’s a lot of history in just a few bloks, or as the Dutch call it: grachten (can you pronounce this?!). The city center is filled with pick up points for boat trips. There are even companies that leave every half hour in high season! These companies are the most popular ones. Some tour operators leave every hour/two hours. Make sure to check this beforehand. Would you like to see the city at night on the canals? Then be sure to book a boat trip at night. You will feel the buzz of the city at night. This experience will be very nice. You will see all the lights on at night and behind it the dark sky. An experience to never forget! You can also make the boat trip during the evening a bit more special! There are boat companies offering a dinner on the boat. A recommendation is to take the Barbecue boat. On this boat they serve you a ‘boat-beer-buffet’. Meaning you can choose your meal from a large buffet (most of the items prepared on the barbecue) and you can enjoy a nice cold beer. You can book this boat with a group of friends as well! Will the weather be a bit colder when you visit Amsterdam? They have heaters on the upstairs deck to keep you comfortable in colder weather conditions.